Furuno’s Navnet TZtouch2 offers a newly redesigned, easy to operate bright 15” touch screen. All glass multi-touch display with built-in 56 Channel GPS Receiver and built-in 600w/1kW Dual Frequency RezBoost Fishfinder with Bottom Discrimination and Accu-Fish. Fully Networkable, Chartplotter with built in Dual Frequency Sonar with Accu-Fish! Furuno’s legendary fish finder performance is now available in a combination TZ Touch 2! Re-designed with a sleek all glass front multi function display that looks as great as it performs. The TZTL15F is a brilliant 15.6 touchscreen display with an internal 56 channel GPS antenna makes installation easier than previous large screen models – no more running wires for GPS receviers, its all included with the TZtouch2 from Furuno. Combined in this large touch screen is an improved fishfinder with a new feature called “Rez Boost” which is a revolutionary new option that utilizes Furuno’s exclusive digital signal processing protocol, to produce fantastic target resolution and separation, and it still uses the standard 10 pin connected transducers that their earlier fish finders used. The internal fishfinder of the TZ Touch 2 also has bottom discrimination and Accu Fish - two of the more popular features in Furuno fish finders. Fully compatible with Furuno’s full line of Ultra HD radars, as well as their DFF1-UHD and DFF3 black box fish finders, The TZTL15F’s all glass, bonded screen ensures there is no chance for it to become fogged during use. The screen of the TZ Touch 2’s are even polarized friendly meaning it will not black out when looking at it through your polarized sunglasses. 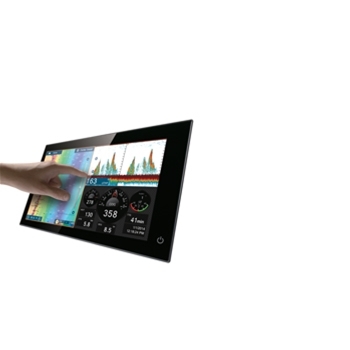 Like the first generation TZ Touch MFD’s the TZTouch 2’s offer multi touch control but it is improved upon greatly with better response as well as being able to swipe your fingers from the edge of the screen. A new graphical interface reduces any learning curve for the TZTL15L and gives the user a new home screen, with its bright and crisp graphics, that is easy to understand and operate. The memory in the TZTL15L is enormous being able to hold up to 30,000 user waypoints, and of course Furunothe TZTL15F offers Wi-Fi and is able to be connected and controlled through an app downloaded to your smart phone or tablet. 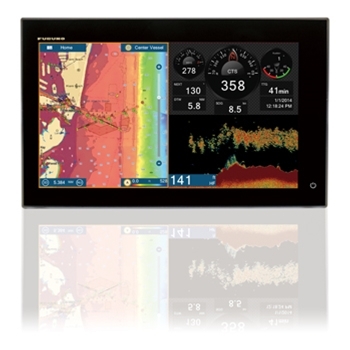 There are just too many features in the TZ Touch 2 TZTL15F to mention, but if you are looking for a first class multi function display to install as a standalone on your boat, or another display to add to your Furuno glass helm set-up the TZtouch2 15 from Furuno will fit your needs. Each one of these units has been refurbished to factory specs and tested by Furuno. They are covered by a TWO YEAR manufacturers warranty and are in Like New condition. Each Furuno 15" TZTouch2 comes with:15" Refurbished Furuno TZTouch2, Protective Cover, Power Cable, User Documentation and a Two-Year Warranty. Furuno 526TID-HDD 1kW Bronze Thru-Hull Transducer with High Speed Fairing Block is a must have for any serious recreational or commercial fisherman. 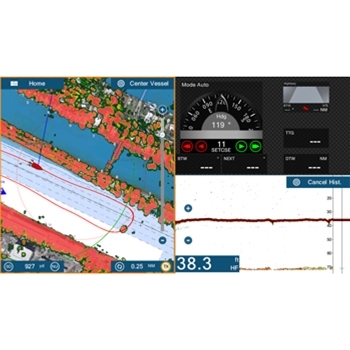 Broadband Technology provides excellent fishfinding and detection. 10-Pin connector for Furuno. Furuno’s MCU002 Remote offers nearly complete control of your TZ Touch 9, 14, TZtouch2 12, 15 or Black Box. A Simple joystick with 10 dedicated hardware keys and push function allows your TZ to expand from Multi Touch to a keyed operation! The Furuno B164 20 1kw Bronze Low Profile Thru-Hull Transducer with 20 degree tilted element is perfect for trailered boats with deadrise between 16 to 24 degrees. Includes temperature and does not need Fairing Block. The Furuno DRS12AX provides the best in Furuno Radar Technology. Lighter and quieter than previous models with enhanced Bird Mode and both long and short-range target detection. New updates to this radar include no PSU required, lighter weight and lower noise. Open Array Antenna Not Included and Sold Separately. Please Choose Between 4’ or 6’ Option. Furuno GP330B NMEA2000 GPS Receiver is designed for pinpoint accuracy with your Furuno NavNet 3D or TZtouch Display. NMEA 2000 Network Required when installing without DRS Radar. The Furuno DRS4D 4kw Digital Radome can be added to any NavNet 3D System to gain a high powered 36 Nautical Mile Radar. Compatible with Furuno TZtouch and Furuno NavNet 3D. Furuno PSU017 Power Supply Unit for Radar Units. The PG-700 Integrated NMEA 2000 Heading Sensor is a rate compensated heading sensor that incorporates innovative electromagnetic compass technology for highly accurate and stable readouts of your ship's heading. Furuno's MCU004 Remote provides Keyed Operation of the TZtouch and TZtouch2 Units. (TZT9, TZT14, TZTBB, TZTL12F and TZTL15F) 10 Hardware Keys consisting of Large rotary knob with Joystick and 8 hard buttons provide near complete control of your TZtouch setup. The Furuno DRS6AX UHD Radar with ultra-clear short and long-range target separation Compatible with TZ Touch and TZ Touch2 Models. Open Array Antenna Not Included and Sold Separately. Please Choose Between 3.5', 4’ or 6’ Option. The newly redesigned Furuno DRS25AX 25kW Radar Pedestal has advanced features including Furuno’s Fast Target Tracking function which allows Target course and speed to display with the touch of a button. Bird Mode, lightweight and simple installation are just a few of the key features in this Radar. The Furuno BBWX4 Satellite Radio/ Weather Receiver provides up-to-the-minute weather and audio information for your Furuno TZtouch and TZtouch 2. Subscription Required.